On my way to get some lunch today, I came past an office on the corner of Rochester Row and Emery Hill Street that was clearing stuff out, boxes, box files, lever arch files, bits of computer kit. A guy in front of me went in and asked if the pile of stuff on the pavement was alright to take away and he was told yes. I toddled off towards Sainsbury’s on Victoria Street. 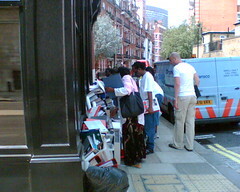 On the way back, quite a crowd had gathered, it was like a rummage sale on the pavement. I half expected in this heat for a little fight to break out over who was going to get the banana yellow lever arch file – but that sort of thing only happens inside offices. People are much more polite in the street. I already had my hands full with my lunch. But I couldn’t walk past without having a quick look and settled on this square cut tile of some sort. The colours caught my eye more than anything. It’s much prettier in real life than it looks in the picture here.